* Xemaül workshop program is organized as a part of Human and Environment Lecture at Istanbul Bilgi University, Faculty of Architecture conducted by Dilek Öztürk&Fitnat Cimşit Koş. "The death of interpretation is to believe that there are signs, signs that exist primary, originally, really, as coherent, pertinent, and systematic marks. The life of interpretation, on the contrary, is to believe that there are only interpretations." 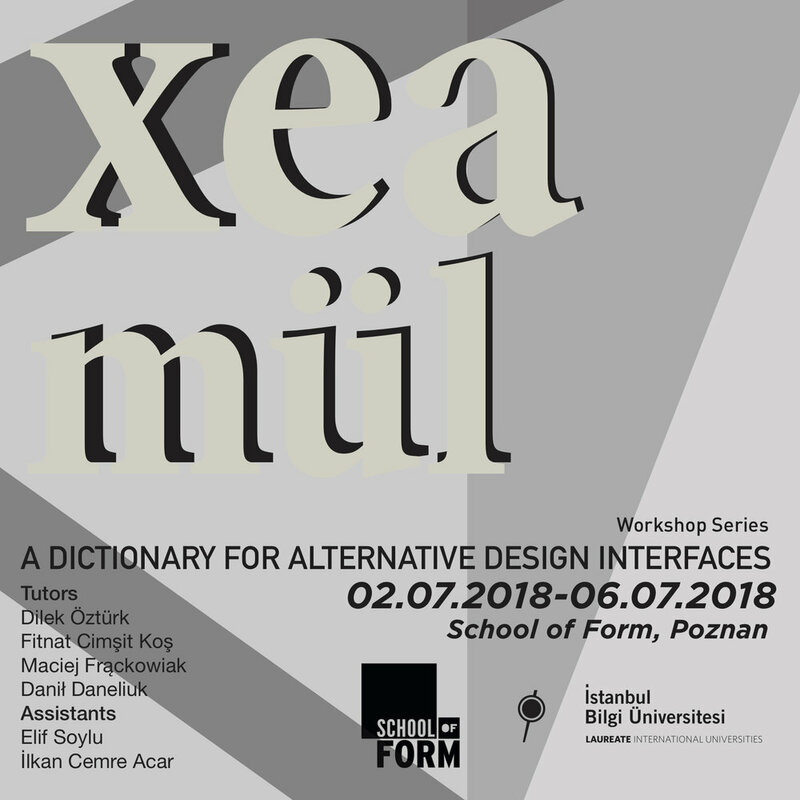 Istanbul Bilgi University Faculty of Architecture and School of Form are teaming up for Xemaül workshop series taking place at School of Form in Poznan between the 2nf of Jully - 6th of July. Discussion topics of the workshop; Responsive Behaviours, Inhabitation of Gestures and Urban Flesh are transmitted into a new visual grammar for each student by experimenting physical, natural, social and environmental issues. This visual grammar is discussed in a non-representative form of practical ground where each relation behaves as an action. These questions led each student to create a self-dictionary of any unexpected design briefs by bringing words and visuals together from scratch. *Xemaül; potential usage possibilities of space/surface/objects beyond their learned usage. A maximum of 15 participants. Planning, Landscape Architecture Departments are eligible for the workshop. Newly graduated candidates, from the departments stated above, can also apply. Participants are required to submit a CV and Portfolio consisting of 3 work samples to info@sof.edu.pl. The deadline of applications is Sunday, 24th of June 11:59 pm. Late applications will not be taken into consideration. 1. Use research tools to analyse how people’s actions produce immediate and long-term consequences on the environment. 2. Synthesise theory and research data to embody a design proposal. 3. Generate a tailored visual and linguistic grammar related to the design proposal. Theory: Each workshop day will start with a lecture and discussion session, followed by a practice question based on Responsive Behaviours, Inhabitation of Gestures, Bodily Tectonics and Urban Flesh. Practice: Each day, students will be given a question in relation with the topic of that day’s theoretical framework. Students will be assigned activities related to research tools and methods. All students are required to prepare a dictionary page for that day’s activity. The visual submission tools may vary from social media to video, text, photography etc.